The Stars & Stripes Puffer is an ornate puffer that requires very little imagination to see how it received its common name. The upper half of the Stars & Stripes Puffer is covered with white spots that appear, from a distance, like stars upon the greenish tan body coloration. The lower half of the body has horizontal stripes that complete the stars and stripes ensemble. 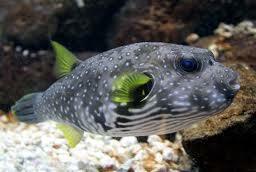 Typical of Arothron puffers, the base of the pectoral fins is darker in coloration. 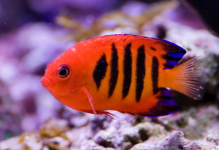 The Stars & Stripes Puffer is sure to make an endearing addition for puffer enthusiasts or anyone wanting personality in their larger, fish-only or fish-only-with-live-rock marine aquarium. 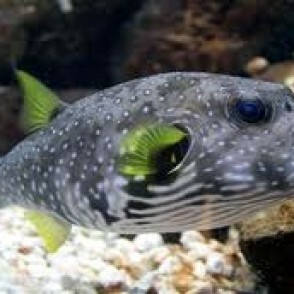 Members of the genus Arothron, including the Stars & Stripes Puffer, are sometimes called “Fat Puffers” or “Dogface Puffers” and exemplify the typical puffer design. Though lacking pelvic fins and a hydrodynamic body shape, puffers are extremely maneuverable and are tenacious and capable predators. Like many “Fat Puffers,” the Stars & Stripes Puffer displays an unusual degree of “intelligence” and “personality” and appears to quickly recognize their owners. In the wild, the Stars & Stripes Puffer inhabits a wide range of habitats including mangrove swamps, seagrass beds and reef flats. 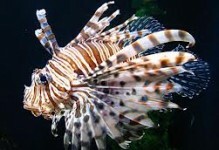 The ideal setup should be an established aquarium 180 gallon or larger with good filtration and a protein skimmer. Aquascape liberally with live rock and other materials to create an environment rich with nooks and crannies, caves, and overhangs while preserving easy access to large open areas. House with fish of similar size and temperament and be aware that the Stars & Stripes Puffer will eat invertebrates found in the aquarium using its fused beak-like teeth to crush open its prey. The diet of the Stars & Stripes Puffer should include a variety of meaty food including squid, krill, clams, and hard shelled shrimp to help wear down their ever growing teeth.